Marking surgical instruments and tools with unique device identification (UDI) numbers has never been more affordable than with the Roland MPX-90M direct part marking device. Unlike traditional dot peen technology, the MPX-90M is capable of accurately imprinting permanent two-dimensional DataMatrix barcodes as small as 1mm2, on hard metals for product tracking and traceability. The MPX-90M allows medical device manufacturers to quickly imprint large amounts of data in a compact barcode format as small as one square millimeter. Ideal for direct part marking of medical devices, components and surgical instrumentation, the MPX-90M prints on materials ranging from surgical steel, titanium and aluminum to matte plastics and acrylic. - Clean, High-Speed Marking on Hard Metal Surfaces: The MPX-90M uses a durable diamond-tipped stylus to directly imprint on titanium, stainless steel and other hard metals. Engineered for speed and precision, the MPX-90M can quickly imprint up to 26 digits of information inside an area as small as one square millimeter. Because it does not burn or remove material on impact, the MPX-90M generates no odors or debris. - Software Included: The MPX-90M includes METAZAStudio software, which instantly converts your numerical data to 2D DataMatrix barcodes that meet GS1 and otherformats. In addition to DataMatrix barcodes, the MPX-90M imprints numbers, text, symbols, logos, photos, QR codes and other graphics with precision. Variable data printing automates the serialization process, making it easy to mark each tool manufactured with a unique barcode, serial number and production date. - Easy to Use: With the MPX-90M, no special training is needed. Getting started is as simple as firmly securing the item to be marked in the included vise, and then using the built-in laser pointer to locate the center of the material to ensure the graphic is imprinted accurately. The imprinted surfaces will not corrode or degrade over time, ensuring that barcodes will remain readable throughout the product lifecycle. With its ease of use, compact footprint and energy-efficient design, the MPX-90M is the ideal solution for small-lot production. It seems a great dental factory here, products' great, customer service is great, Happy ! 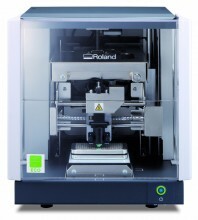 Click the button below to add the Roland MPX-90M Dental CAM Milling Machine to your wish list.